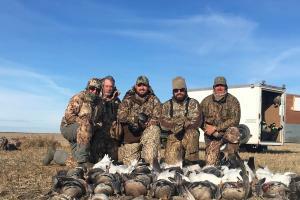 Thunder Creek Outfitters - world class outfitters in southern Saskatchewan. We would love to introduce you to some of the best bird hunting in North America. I am continually amazed at how unique each fall is. Thankfully, waterfowl still migrate. Two years ago, we got rained out. This year, it did not rain on us one day. I don’t mean to say we had perfect weather. We had unprecedented cold the last week of Sept. and the first week of Oct. and then the next two weeks were warm and sunny. 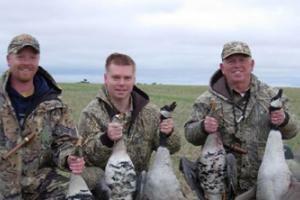 Last year we went after snows for both the morning and afternoon hunts on several occasions. This year, we hunted snows very little. The most definitive thing about 2018 was that here were almost no juvenile snow geese. From what I have heard, everyone was having a tough time decoying snows. When you study a flock carefully and cannot find a young bird, you know it probably won’t take long to clean birds after the shoot. The overall numbers were good and they came early because of the extreme cold but the flocks that had some juvies didn’t show until the last week of October. So, we had the same adult snow geese week after week. Because of the situation with the snow geese we spent more time hunting dark geese. 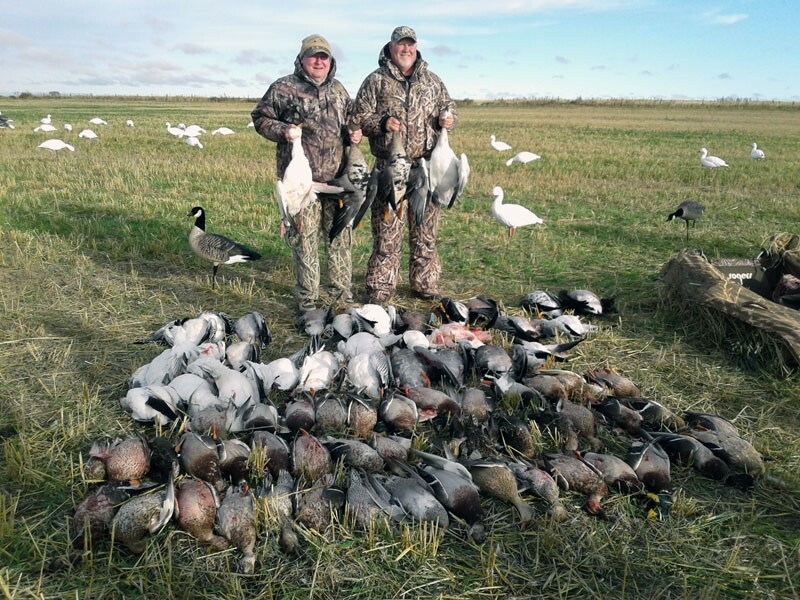 I think it was our best ever season shooting hookers (Canadas) and whitefront (specs). In early Sept. we decided to replace all of our full body honker decoys with new Avian X honkers. It was a timely and good choice. They look great and are quite compact. What I like best is that all of our snows, honkers and duck decoys are Avian X with the same motion stake system. It is ideal for outfitting because they are high quality and look great and everything sets up the same way. When I think about our crane hunting, I notice a smile coming on my face. They are fun to decoy and we had our best ever season hunting them as well. That’s one of the nice things about having several different kinds of waterfowl to hunt. The snow hunting was marginal but we had excellent honker and crane hunting. We had some spectacular duck hunts, but it wasn’t consistent. The main reason is that we have had considerable competition for the ducks from non-resident hunters who shoot the ponds where the ducks are staging or roosting and that runs the ducks out of the country. I wish there was a simple solution to deal with that. Superb decoys are a thing of beauty. We feel like full body Avain X are the best available so, as I mentioned above, that is what we have for snows, Canadas, and Mallards. The only decoys that are better quality is the Deception crane decoys. They are over $100 a piece and hard to get but we have been buying a few each year and plan to continue doing that because we have all the other decoys we want and we do want to keep improving our crane decoying. Another thing I did to improve our set up this fall was to hand tie more sisal twine on our blinds. I mean more. Lots more - Nearly 1 mile of twine on each blind. It was extremely time consuming but the blinds look so good that basically we just have to “stuff” them with a bit of right colored material from that specific field and we are set. I was so pleased with the results that I plan to do even more before next fall. I also plan to cut the snow stakes down to 20”. We have had too much trouble with shadows on sunny days, especially in pea or lentil fields. In spite of the snow goose situation, we had a good solid season (with the exception of the last week, which we don’t normally use). The last few years, our early weeks have been the best hunting, and so we would like to move our hunts earlier when it works for our long-term clients. We may have a week open for the fall of 2019 so please be in touch if that would be of interest to you. I want to say “thank you” to our clients. You have become very special friends. Thank you for consistently coming to hunt with Dan and me. We have always had family hunts but this fall we even had two grandsons come along!